Main floor master with walk-in closet, wood laminate flooring, and vaulted ceiling, The main floor has wood laminate flooring and vaulted ceilings. The great room has a gas fireplace and built-in shelves, the eating area has a slider that leads to the back deck. The kitchen has a nice stainless steel refrigerator, white painted cabinets, a butcher block counter, lots of natural light, tile flooring. Main floor laundry with washer and dryer included. Upstairs there are 2 additional bedrooms with mountain views, new carpet and a full bathroom with tile flooring. Newer carpet and windows, Nest thermostat. Fenced back yard with a large deck, sprinkler system. 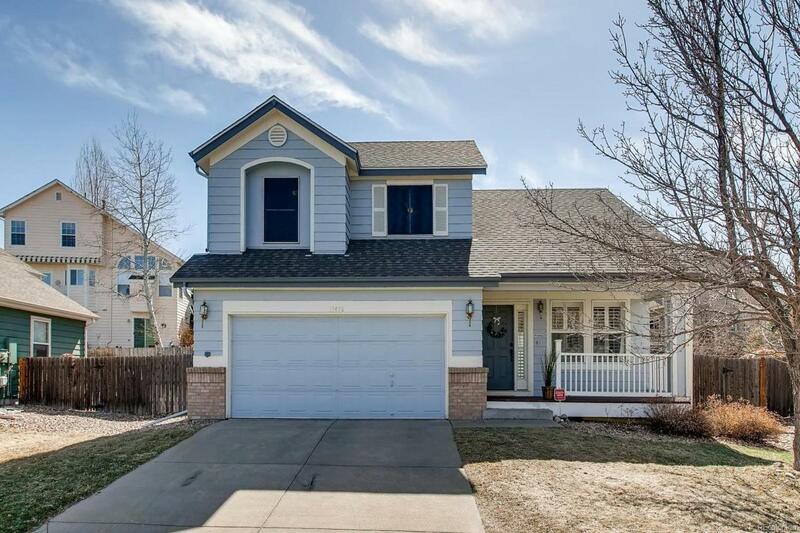 Great Stroh Ranch location with community rec center with indoor and outdoor pools, fitness facility, tennis, racquetball and basketball courts, close to Cherry Creek Trail. Easy access to Parker Road or Hess Road to I-25.